But if the word chandelier only conjures up images in your head of large, lavish, dripping-in-crystals chandeliers that are often associated with royalty, that's not the only kind of chandelier available these days. Sure, you can still get those if that's what speaks to you, but there are chandeliers on the market to fit all styles, all spaces and, maybe most importantly, all budgets. 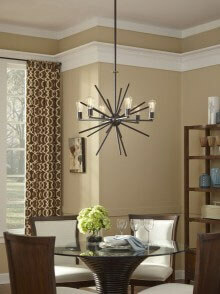 There are even scaled-down chandeliers (called mini chandeliers) that are well-suited to smaller areas. Plus, chandeliers have staying power. Unlike other trendier fixtures that may be outdated someday, a chandelier is timeless and especially inoffensive when it's time to sell the house and appeal to the tastes of potential buyers. A chandelier or chandelette can fit in pretty much any space. Some people are even putting chandelettes in their bathrooms. But when you're looking for a chandelier, keep size in mind. If you're hanging a chandelier over a table, like in the dining room, then measure the diameter of the table and look for chandeliers that are between 2/3 and 3/4 of that width or diameter. If you're going to add a chandelier to your foyer, a good rule of thumb is to add up the width and length of the foyer in feet to find the ideal diameter or width of a light. Also remember that the higher the ceiling, the taller the chandelier should be, and the bottom of the fixture shouldn't be any lower than 8 feet off the floor. A good rule of thumb is that, no matter where it is going to be, chandeliers need to be proportionate: one that's too large will make your space look crowded, but one that's too small won't be prominent enough. Are you thinking of crystal? Remember that the crystals need regular cleanings to look their best. Clean your chandelier once every 6 to 9 months. Some people remove all the crystals to clean them separately, but if you don't want to do that, here's an easy way to clean: fill a spray bottle with a solution that is one part isopropyl alcohol to three parts distilled water. Then, using a clean white cotton cloth or gloves, spray the cloth or hand with the solution and then wipe the crystal. Follow immediately by wiping the crystal dry with a dry cloth or glove. But if you do want to remove the crystals for cleaning, make sure to label where each one goes so you can reattach them correctly. Use lukewarm, sudsy water with Palmolive soap. Then rinse in clean water and dry with a soft, clean cloth. Watch this video, where lighting designers give their advice on the subject. Read up on how to select the perfectly-sized fixture for your space. Contact us or give our lighting specialists a call at 1-866-688-3562. Sign up for our email newsletter today and score an additional discount!